The media are all over the unprecedented nature of the letter — which informs Iranian hardliners that Obama’s likely deal with Iran is a “mere executive agreement.” Chris Matthews and Chris Hayes and Michael Steele on MSNBC last night all expressed outrage or surprise. Paul Waldman at the Washington Post calls the letter “stunning” and “appalling.” But apart from a passing reference to neocons from Matthews, no one is looking under the hood. In the wake of the revelation this week that Israeli Prime Minister Benjamin Netanyahu was caught on tape bribing unnamed republican congressmen to vote against President Obama’s Iran deal, angry Americans have been asking for specific names and numbers in order to gain a better understanding of just what level of treason has been committed. Now it turns out one republican name has surfaced in particular, and one very large dollar amount. That name won’t come as a surprise to those who have been watching closely. United States President Obama has long had a strained relationship with Israeli Prime Minister Benjamin Netanyahu, despite the two nations being historically close allies. Obama’s reasoning has been straightforward: Netanyahu is a corrupt warmonger has intentionally made his region unstable for his own political gain. Republicans have fired back by accusing Obama of simply being anti-Israel. But wiretaps now show that at least some republicans in congress had an entirely different reason for siding with Netanyahu: he was bribing them to change their votes on key issues. In an explosive revelation, wiretaps uncovered by the Wall Street Journal reveal that Benjamin Netanyahu reached out to republican congressmen who had been considering voting in favor of the Iran peace deal, asking what they wanted in return for voting against the deal. In the end, not a single republican voted for the deal, meaning that Netanyahu’s bribes succeeded in swaying the ones who had been on the fence. 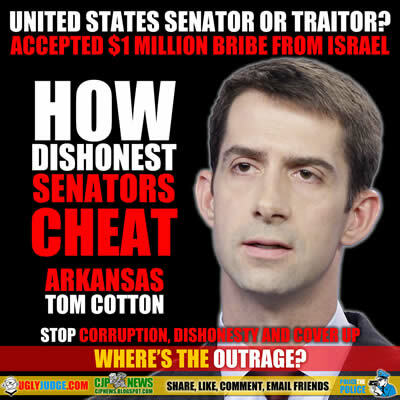 That means that not only is Netanyahu actively working to undermine the sanctity of the United States government, the republican congressmen involved may have committed treason under the Espionage Act. While it’s not uncommon for members of congress to offer each other political favors in exchange for votes on various bills, it’s an entirely different legal matter when those offers come from a foreign head of state. Not only were they caught accepting favors from Netanyahu in exchange for votes on the Iran deal, they also received confidential details of the Iran negotiations directly from Netanyahu himself. Republicans have long criticized the Obama administration for its wiretapping of Netanyahu, but now we know why: they didn’t want the details of their own wrongdoing to be discovered in the process. The Wall Street Journal has more on the story. Notice the pattern, Gentle Reader: money comes in, and a letter goes out. It is bribery, plain and simple.